European Commission President Jean-Claude Juncker and EU foreign policy chief Federica Mogherini were both tricked into believing they were discussing policy with the Armenian prime minister in recent phone calls by Russian pranksters, a report by Euronews says. In May, both Juncker and Mogherini participated in 10 and 12 minutes calls, respectively, days after Nikol Pashinian was sworn in as Armenia's premier. They were actually speaking with Alexey Stolyarov and Vladimir Kuznetsov, however, raising concerns of security breaches as the leaders discussed international politics. On May 9, Juncker took part in a conversation about U.S. President Donald Trump's decision to pull out of the Iran nuclear deal. "This is a major concern for us and for me personally because I do think that this is a major mistake, the one that Trump had made yesterday night," Juncker told Stolyarov. "We as Europeans, we are sticking to the Iran deal. France, Germany, Britain, others, including the European Union itself, we will stick to that agreement and we don't want to destabilize the region. And as Iran is your neighbor, you have the highest interest in having the whole region being stabilized so we are working in that direction," he reportedly said. When Stolyarov, posing as Pashinian, said Armenia was being pressured by the U.S., Juncker responded: "We have to explain again and again the world to Mr Trump, he doesn't understand what it's about. We will make sure that he has a better understanding of what is happening in Armenia." Juncker also advised the pretending prime minister to maintain good relations with Russia. "And with Russia, we are not asking to break your relations with Russia. It's important that you will have a meeting with Vladimir Putin, I think on the 14th of May or something like that, that's good. It's good. He's a personal friend of mine so I can talk with him whenever it's needed," he said. In a classic prankster move, Stolyarov slipped in a last-minute comment that "team Kardashian" would like to join the ministry of foreign affairs. "Oh yeah, that's good," Juncker responded. 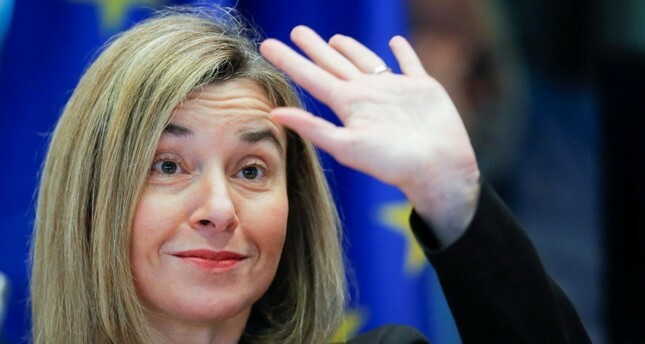 With Mogherini the pranksters talked about geopolitical pressure on Armenia from Russia as well as Turkey and Azerbaijan, to which top EU diplomat said Yerevan can count on the 28-member bloc. "You're not living in an easy environment but you can count on us for sure for having a friend on which you can count. It's true it's a challenging region and again you're facing different sorts of pressures and challenges but I'm sure that there could be a way to smooth the tensions and try to find cooperative approaches," she said. "Count on us anyway every time for discussing and finding a way forward and cooperating very, very closely." When Stolyarov said he was going to discuss with Baku the issue of Azerbaijan's occupied Nagorno-Karabakh, Mogherini gave the talks full support. "If you manage to move with some positive steps for us it will be crucial because having an open issue like this between our two strategic partners — Armenia and Azerbaijan — that are both important for us is painful," Mogherini said. Western critics suspect the comedy duo have backing from the Kremlin. Stolyarov and Kuznetsov, who have fooled high-profile victims around the world, have denied links to Russia's security services. In the wake of poisoning of ex-Russian spy Sergei Skripal and his daughter in Salisbury, England, the comedians pranked U.K. Foreign Secretary Boris Johnson also posing as Pashinian. In 2015, they phoned Elton John pretending to be Russian President Vladimir Putin after the musician criticized Russia's stance on gay rights.